This is a complimentary layered outfit of three pieces, working together as an effortless way to stay warm in the cold a la early 70’s style. Three of the major pattern companies contributed towards my outfit – Simplicity, Burda Style, and Vogue – to spread out my contributing sources. This is also one of those fun oxymoron outfits where I find alternative ways to wear garments taken for granted…my shirt dress is actually worn like it’s a coat. It is a heavy denim, flowered and all. It’s like I’m bringing the flowers from out of season to the sleeping winter landscape. My turtle neck top is not at all dated but actually quite enticingly fashionable, and it’s neither fit on its own for the very cold temps, mostly just a perfect layering piece, especially with its short sleeves. 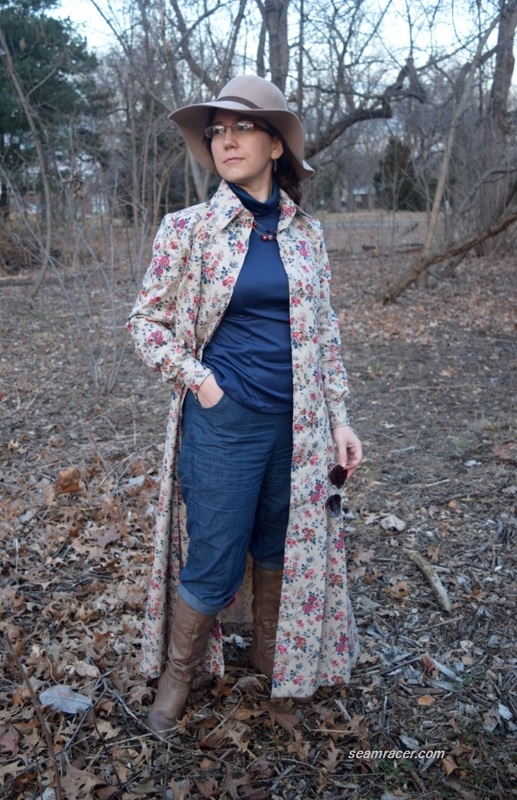 The jeans were made by me as well, from a pattern of a different era (blogged about in a separate post here). 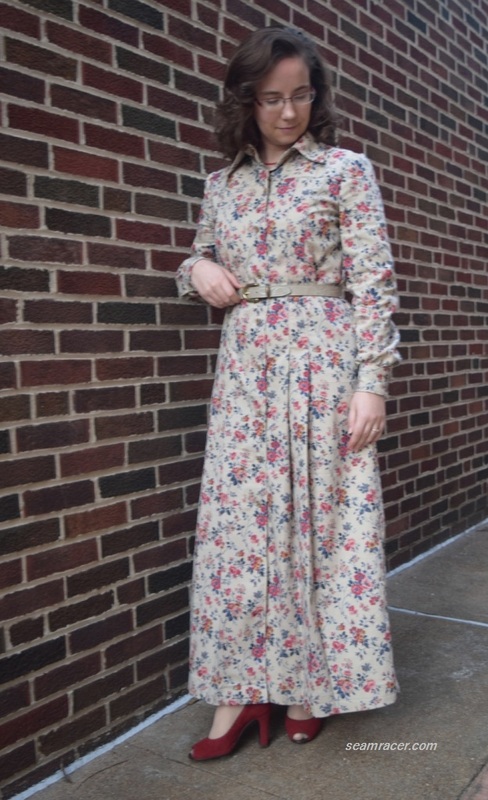 I can even eliminate the extra layers underneath and wear the shirt dress with my vintage 70’s heels and a neutral belt for a dressy outfit at the other end of the spectrum (seen down later). Yeah, I love to mix things up and break boundaries – a least a bit when it comes to the clothes I make! This outfit is made for Allie J’s “Social Sew” for the month of January 2017 “New Year, New Wardrobe”. There isn’t much I intend to change for this coming year’s sewing, besides filling in new dates of historical sewing (teens era, and early 20’s), and continuing to try new techniques and having fun doing unique and meaningful outfits (loose resolutions, I suppose). I feel that this outfit applies to the monthly theme because the dress was a U.F.O. (unfinished object) as of 2016 fall, and I was starting new tackling it and finishing it so as to be happy with it. This outfit further applies to the monthly challenge because I have been meaning to make these items for a while, like since 2014 for the dress and turtle. 70’s style is still “in” so I guess there’s no time like now to just get around to a long intended project. NOTIONS: I had (believe it or not) everything I needed to finish all this on hand already without needing to buy more than an extra spool of tan thread. I used three different colors of bias tape (whatever was on hand), used a vintage metal zipper for the back of the turtleneck, and used vintage buttons and the belt buckle from hubby’s Grandmother’s stash. TIME TO COMPLETE: The dress was halfway made in October and November of 2016, and completed this year, finished on January 20, 2017. I’m guess-timating a total time of about 25 hours spend on the dress. The belt was made on October 21, 2016 in only 3 hours, and the turtle top was made one night the week after that in about 3 hours, as well. TOTAL COST: The vinyl was a remnant bought on double discount at Jo Ann’s Fabric store – a total of about $4 for one yard, so there’s plenty left over for a purse, yay! The other fabrics were something on hand for so long I’m counting them as free. Thus, between the vinyl and the thread, this outfit cost me about $6. Sorry, allow me to pat myself on the back for this one. I am so, so happy to have finally found a use for this floral denim. It had been in my mom’s fabric stash since I can remember, then she gave it to me for my stash and I had no intention or even remote idea of what to do with it for so many years. There were 4 freaking yards of this dated-looking flowered denim that could be from the 80’s for all I know. So when I happened to notice my Simplicity #5909 1973 pattern having a similar looking fabric, I was sold. Choosing the ankle-length, long-sleeve option was a give-in to use up all of the bolt, as well. I might have been taking an easy road to follow an existing drawing, but – hey, at least I found a use for what seemed doomed to be an ugly duckling in my fabric stash! Making the shirt dress was technically not hard – it fits me great out of the envelope with no real fitting. What was difficult about it was dealing with the large amount of such a heavy fabric. Marking all those pleats and buttons all the way down was exhausting. Besides, the stitching required to sew this fabric hog together was boring, straight, and monotonous, especially when it came to the long side seams. Just trying to stitch on it was its own problem. Half of the time it took me to stitch was I think spent throwing and pushing around fabric so as to even get it laid out right just to sew on it. I’m not meaning to complain, just wanting to throw this fact out to anyone who is thinking of making a 4 yard denim shirt dress, too – you’ve been warned what you’re in for. Like I say, though, it’s worth it in the end. I’m loving the features of the shirt dress. Of course it has the large collar lapels that are so traditional on 70’s clothes, but this collar also has an all-in-one collar stand. There are separate chest front and back shoulder panels which keep the upper bodice flat, without the pleats of the bottom 2/3 of the dress. There are long horizontal knife pleats in pairs all the way down the hem, four in both front and in back. 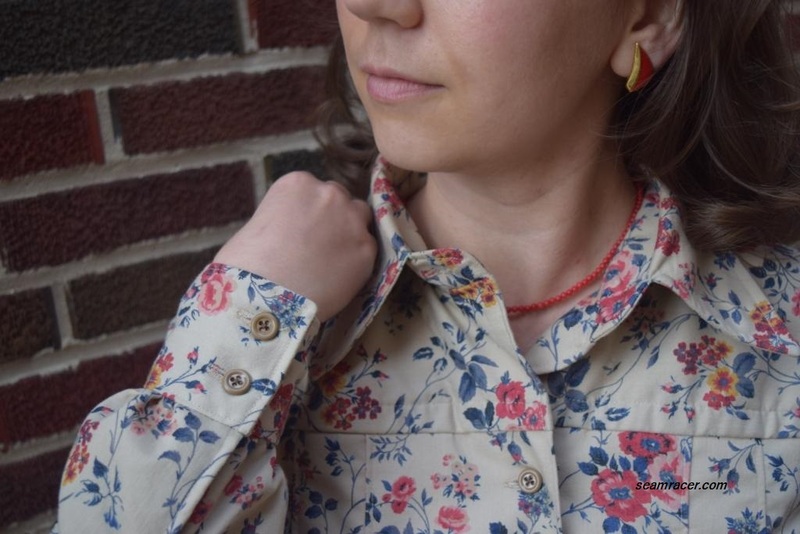 The extra wide cuffs have a lovely double button closure, with a continuous lap opening (for which I merely used pre-made bias tape rather than self-fabric). A baker’s dozen of camel-colored vintage buttons complete it. This dress pattern’s long version was definitely designed for a woman with weird proportions – tall women with petite length arms. I am about 5’3” and I had to do a 4 ½ inch hem to have it fall at my ankles. However, the sleeves were so short, and I had to add one extra inch in length to make them appropriate for my arms (and my arms are a ‘normal’ length, not petite). The denim is soft with the little bit of stretch, but still heavy, so in lieu of interfacing I chose only to use a medium weight, non-stretch 100% cotton. 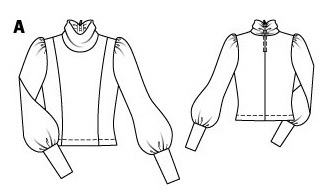 It stabilizes the cuffs, collar, and upper back and front bodice panels with making them stiff. I do have to laugh at how much of a rustle my dress makes when I move. The fabric is not a heavy of a denim as my husband’s Levi jeans, but it sure does make a heavy, sort of muffled static “white noise”. 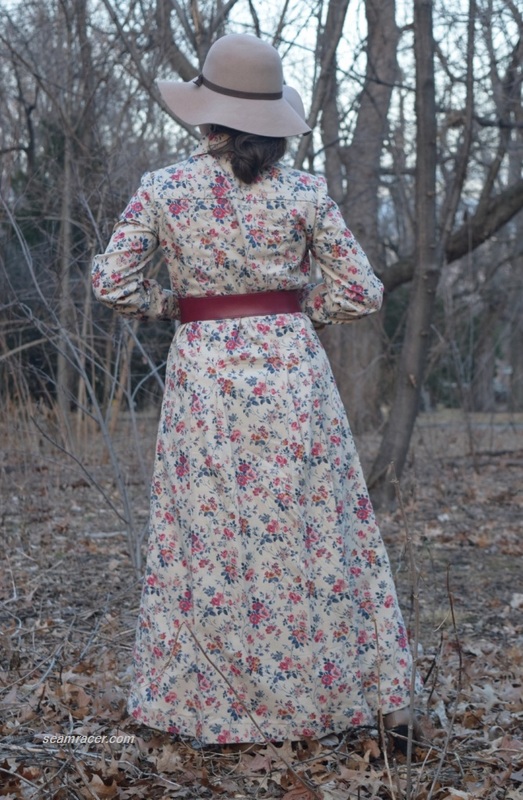 Definitely not the best dress for sneaky espionage work…no possibilities of quiet stealthiness in my denim coat-dress. I’m just doing some silly reflection. It is a great winter dress! Someone that recently gave me a compliment on my outfit commented that you just can’t find anything like this to buy – yes, that’s why I sew! The other great chill buster that keeps me cozy is my lightweight turtleneck top. 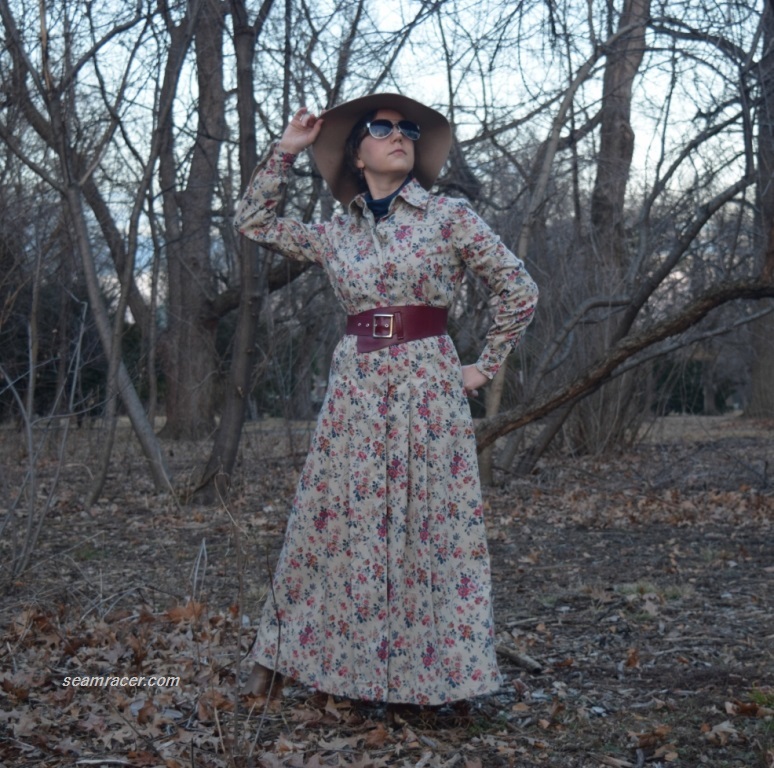 I figured the turtle pattern would work well with my 70’s dress because the Burda model picture looks very late 60’s with the equestrian-style helmet/hat, her long hair, and A-line pleated skirt. This was so ridiculously easy to make I couldn’t stop voicing my amazement for a while after I finished – just a few hours and voila! Of course, my top was made up more quickly without having the full long sleeves, but even still this is a great pattern. I barely had a yard of the interlock knit leftover and I was able to make this!? I’m so tempted to whip up a dozen of these turtles in every variety – quilted knit, sweater fabric, sheer fancy stuff, and more especially I’m hoping to find a funky printed knit for a true Space Age look to go with my ’67 jumper. The back neck exposed zipper is sort of mixed feelings sort of thing for me. I love the modern way it looks even though it is a vintage 50’s or 40’s era notion. I do not enjoy how it almost always gets caught up with my hair even though I close the zip with my head upside down so my hair isn’t in the way. Oh well, win some, loose some – I cannot think of a better solution so I’ll shut up about it. Hint, hint – when in an adventurous mood, you can even wear the back neck unzipped and the stand-up collar lays flat on the chest for a completely different appearance to the top! O.K., now I’ll move on. Another amazing thing to this outfit is the belt. Look at that asymmetric loveliness! It’s freaking awesome. I look at it and can’t believe I made it, it seems so professional. This is a really great design and it has wonderful shaping for around the waist – this is not a straight rectangle sort of pattern. 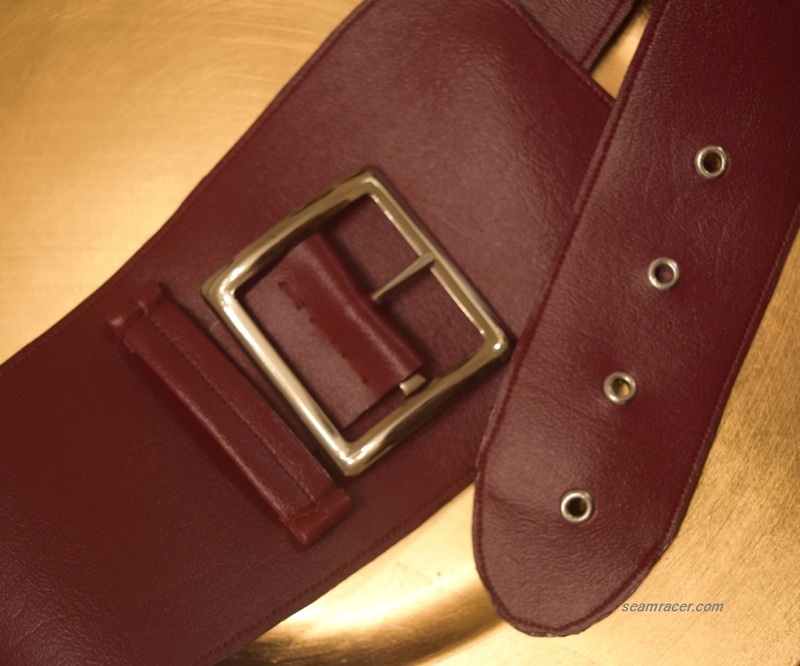 Belts might seem hard to make or even mysteriously different and even intimidating (working with vinyl or leather), but all of that is blown away by using Vogue #9222. The instructions are clear and all the designs are so neat I intend to make all of the views available. In your face ready-to-wear, store bought belts…I can make something better than you, you are often only half belts, with elastic across the back. My belt is all belt, 100% my style and my make! 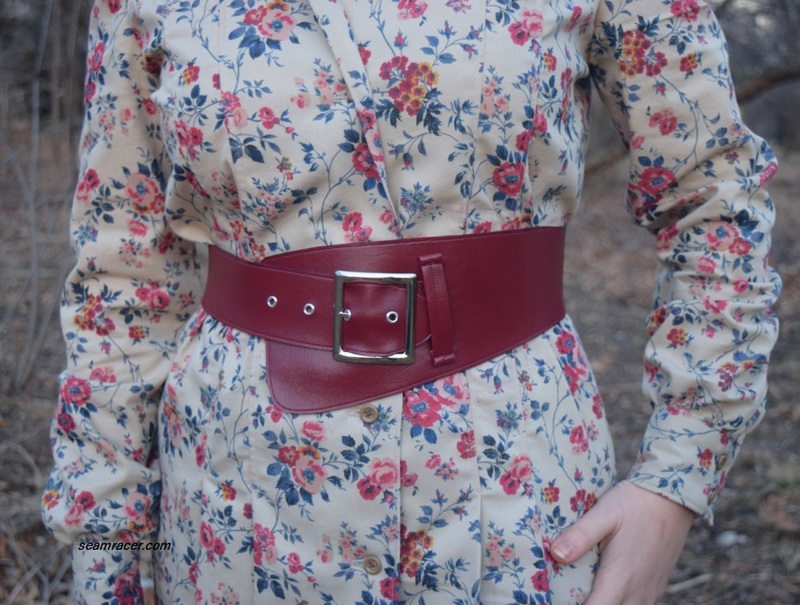 My only caveat is that I wish I had extended the length of the belt to go up to the next size. Cutting out a paper pattern on a slick vinyl leaves room for shifting and a small margin of error. In order to get the two belt pieces matching together, I had to trim them down slightly, and thus I ended up with a belt that was a little smaller than the pattern intended. This is why I recommend adding an extra 4 or so inches to the belt length going around the waist. You can always cut some off, but you can’t add it on, especially when it comes to vinyl. I was able to machine stitch most all of the belt, but I used a tiny ‘sharps’ sewing needle to hand sew on the buckle and the belt loop. I did not want to test four layers of vinyl on my machine so I did not fold in the edges of the seam allowance. I left the edges raw and tried something experimental. Taking a hint from store bought belts, which have some sort of seal along the raw edges, I used a matching colored nail polish (yes, fingernail lacquer) to paint over the edges of my belt, both coloring and sealing them at the same time. It’s a rather permanent option, nevertheless I did see some faint rubbing off of the nail polish onto my dress after one wearing. So – it’s not perfect, but an easily available solution that I am happy to see worked out so well. This was the first time making grommet eyelets and I think they are a success. I have tried before again and again to get metal grommets to turn out right, but that was experimenting on fabric (for a corset) and this time they came out much better in the vinyl. It was like a boost of confidence I needed, feeling that ‘o.k. I can do grommets, I understand how they work now’ so maybe, eventually I can have them turn out well for my future corset. Does anyone have any tips to share about the keys to successful metal grommets or even what to avoid? Should I add some glue to the back (to keep them in place) and can you replace one if it gets wonky (or does that not work)? Just wondering. 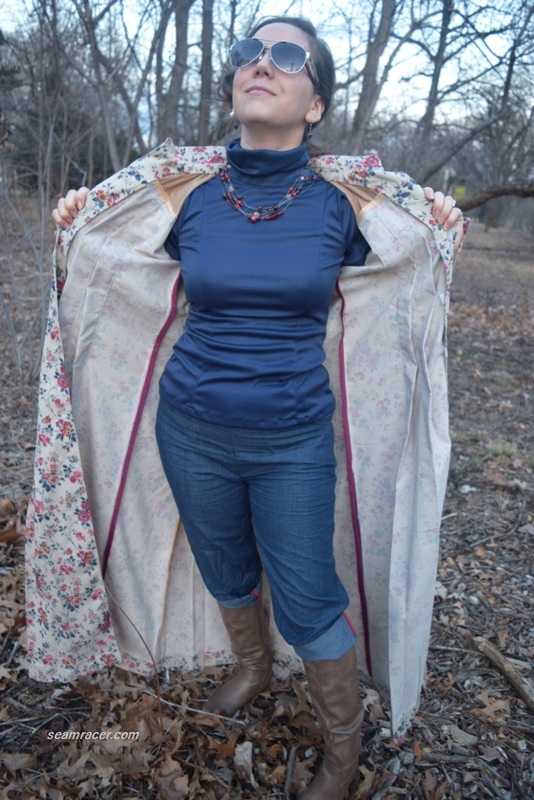 I hope this post has inspired you to see outside of the traditional box for sewing and making every day-type of clothing items. There is so much room for inventiveness when you make things yourself, the sky’s the limit! 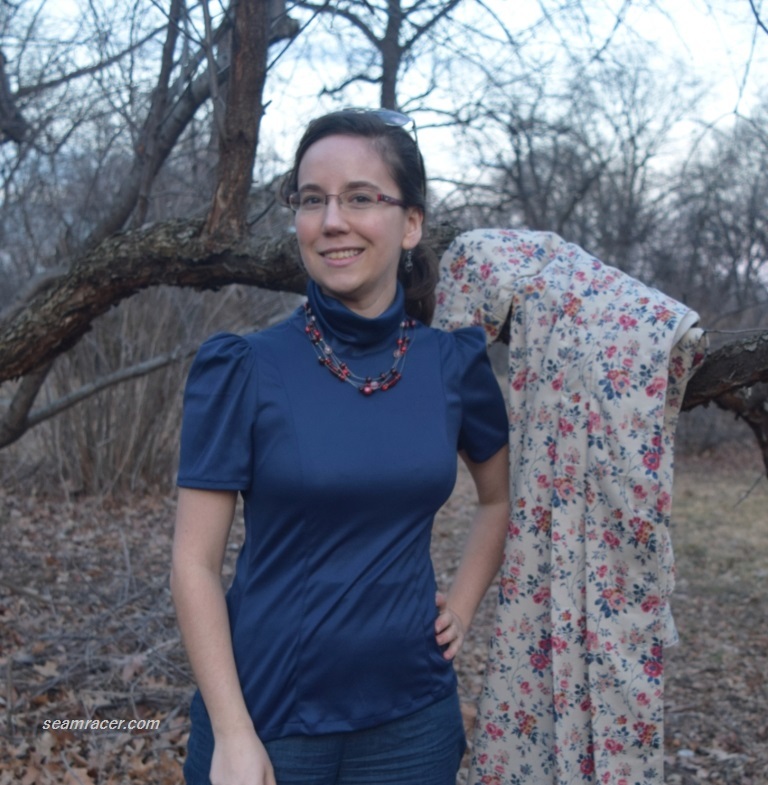 A dress that is a shirt-dress worn like a coat, a belt finished-off with nail polish…a girl’s gotta do what she has to do when she gets an idea with a sewing machine, some material, and extra time on her hands! Yup, I live on creativity and can’t stop. Do you, too, have any big hopes for making some neat things this year, something which gets you all amped up just to think about it? Do you too have some ‘ugly duckling’ fabric around just waiting for the ‘right partner’ in the form of a pattern to complete it (or did you ditch it)? What is your favorite way to put yourself together to combat the cold weather? 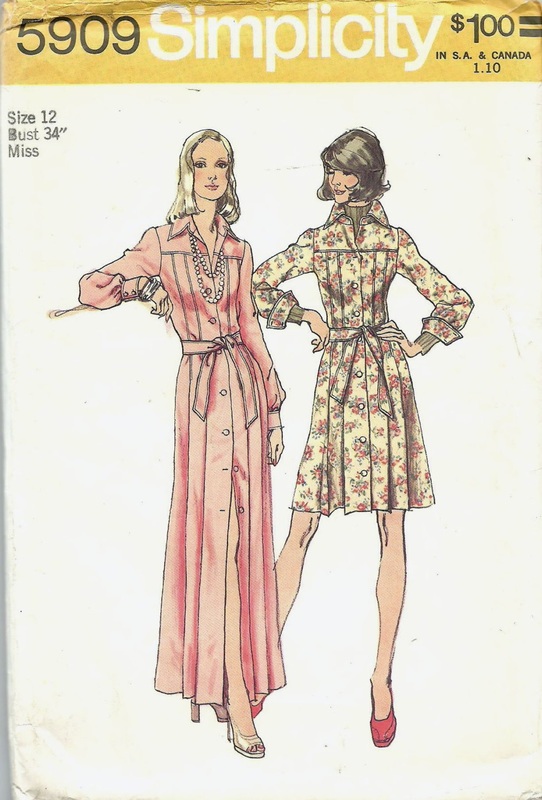 This entry was posted in 1970's and tagged "exposed zipper", "Simplicity pattern", "Social Sew 2017", 1970's, 1973, belt, belt making, Burda Style, Burda Style #114, Burda Style December 2014 pattern, Burda Style patterns, coat dress, denim, denim shirt dress, dress, floral, flowered, flowered denim, knit, novelty denim, retro, sewing, sewing with vinyl, shirt dress, Simplicity 5909, turtleneck, turtleneck pattern, vintage, vintage fabric, vintage notions, Vogue 9222, Vogue pattern by kellycb. Bookmark the permalink. 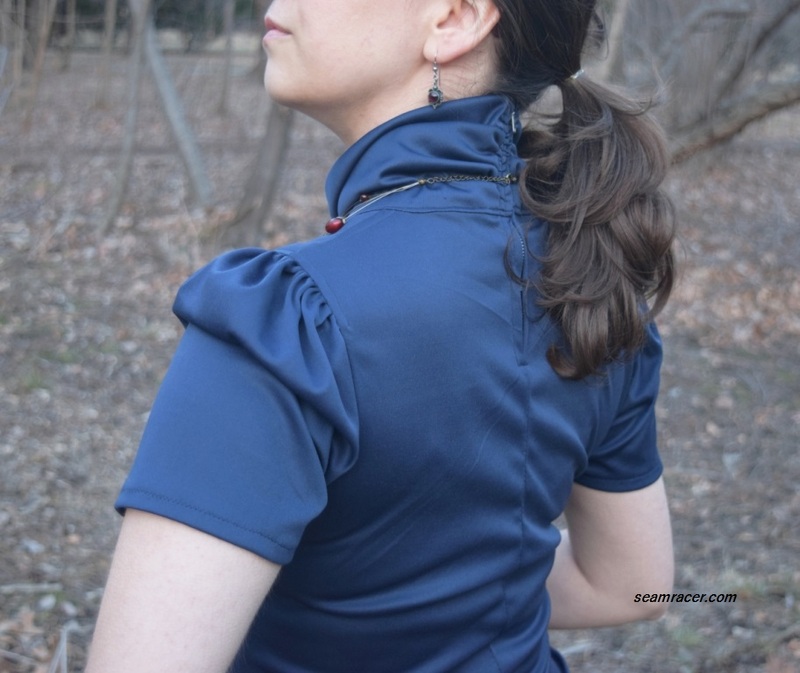 I swear I used to have that turtleneck – I remember those puffy sleeves and the gathers. I am going to have to remember that belt pattern. I can’t find one like that anywhere. Altogether a fabulous outfit (again)!!! Thanks, Linda! It’s neat that you remember this style of t-neck. Was I was right in guess-timating the era of the pattern? 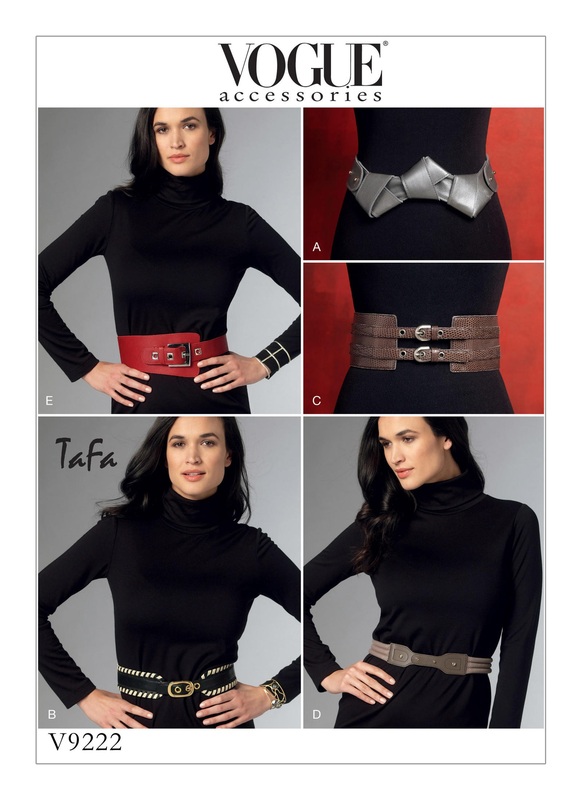 I’ll be looking out for your belt made from the Vogue pattern. You know, I might have found a sort of comparable version to buy but it was way over $50! Too much dough when making one is so easy, right? Vogue had better keep this pattern in circulation! Your guesstimating is probably more accurate than my memory! I’d say the early 70’s. $50 for a belt is ridiculous!